There is a lot of great science that will be freely streamed via AGU On-Demand (registration required), and there’ll be a lot of commentary using the hashtag #AGU15. Many posters will be available online too. A few highlights have already been discussed by Victor Venema related to the surface temperature station datasets, but there’ll be much more on offer if you dig deeper. As the week goes on, we’ll link to anything good we see, and we’ll be happy to host any commentaries that anyone has on specific climate sessions or talks. Registering: What am I supposed to put for organization? Will “none” work? So I got registered and found abstracts to read. There are lectures going on right now and I am logged in. But I haven’t found a way to see lectures. How do I get to watching/hearing a lecture on the science? Channel Listings and another for the scientific program. The Paris agreement is unprecedented by a wide margin in several ways. By the result, by the number of parties and groups, and by the process itself. They track the results of a process commited to inclusiveness and transparency that made agreement possible in the first place and, in the end, the agreement itself. Chief Data Scientist DJ Patil began his talk at the AGU with a nod to the importance of visual information, and said we need to “take back the data.” Richard Alley touched on the topic of visuals indirectly when he spoke of the need to make consensus climate science understandable to more people, more segments of society. Other conveners and many conferencers can find a lot to relate to and recommend not only in the text analytics linked above–but in the whole platform–I think. It includes “Our Story,” a Chris Jenkins video. In the Questions session [after Monday’s DSCOVR session, https://www.youtube.com/watch?v=hoRp5zPXbvY%5D some guy :-) bless him asked the question I wanted to hear — are there plans to put a corresponding instrument over the middle of the night side. Gavin told me years ago at RC that whenever Triana was in place, we’d still need a corresponding instrument on the night side to get a simple answer to the radiation balance question. While saving the world from industrial civilization, remember we also need to stop those stripmining it one person at a time, because they can. I suppose they’re worth more because they won’t be able to reproduce. I wonder if Sea Shepherd wants to take on the Red Navy. 4 Hank Roberts: I was able to see some of the youtube. They appear to be news conferences for the public. I have not yet seen one of the science lectures. I will try to do so tomorrow. I followed your instructions. Does it only work in real time? I am looking right now in the night. EG – I registered, did you? Assuming you’ve registered using an email address, and you log in with that, where do you encounter a problem? I go to the AGU On Demand page; I click the “View Channels” tab; I click any of “Climate” or “Earth Discovery” etc. ; from the list choose what’s “Live Now” or upcoming “Add Reminder” or, for what’s already happened, the “On Demand” link. If all else fails, try that. I’m assuming you’re an AGU member? I don’t know if any of this works for people who haven’t joined AGU, though I don’t see it said either way. This may be a double post. I got logged off. I urge people to view the DSCOVR session. For us nonscientists you could skip everything up to 44:10, where Stewart Brand speaks for three minutes. Listen to him and the question and answer session following on after that with the panel. Al Gore answers — a long silence, “that is a good question” and then a longer answer about the immense data collection, going back decades — that’s not available. We could be so much smarter than we allow ourselves to be. Not an AGU member. Got to the right place yesterday. Can’t find the help phone number today. Missed it. Could see a lecture. Don’t know where I am now. Goes in circles, never goes to the place where I found the right lecture. I am logged in repeatedly. goes only to an abstract now, but the meeting was just now. There is no way to make it go to the meeting instead of where it went yesterday at that same URL. The browser back thing doesn’t work right. I can’t get back to where I was. Are the lectures recorded for instant replay? Is the actual meeting in Chicago or San Francisco? I closed all of the windows and turned Safari off and back on and logged in again and that is what I am getting now. All of the channels are the same. Why would AGU do that? Is the real science a secret? I managed to see that there are about 4 or 5 lectures on Pluto. I hadn’t realized that AGU did astronomy. There are about 7 categories of subjects. The first category is climate. If I remember right, RC will not give us a post on each of the climate articles. I hope to see more on Pluto from my free subscriptions to NASA news. Hank Roberts: Is it worth the $50 to join? There are too many things to join. The web site needs a lot of work either way. Why would AGU do that? Is the real science a secret? It’s just you, not the rest of the world. Did you use the troubleshooting links at the bottom of the intro page? Did you click the link at the top labeled “Help”? View the DSCOVR video by this weekend at AGU — they’ve announced they are not making it available to download nor view after AGU closes its doors. I swear this is stupid. Well, no wonder they make it so damned hard to see, eh? 19 Hank: You are the only one who mentioned dues. Several other people should have. We can say that there was a hole in AGU security on 16 December and I got to watch part of a lecture. The AGU is missing out on an excellent occasion to get new members. They didn’t have a ticket window/booth on the meeting web site. The time to get new members is during the fall meeting lectures. Yes, I went to all of those help and troubleshooting things. They never told me that I needed to join or buy a ticket. Instead, the user unfriendliness wasted about 4 hours. That is not good for getting members either. I think that, even for members, the web site requires going through a “ceremony” that is absurd. Reference: “The Trouble With Computers” by Thomas K. Landauer, © 1995, MIT Press. Follow Landauer’s procedure. The programmers will not like it, but it is necessary. Landauer’s cardboard boxes are not necessary. AGU needs to have a deal where the member presents a ticket and then can easily get to wherever he wants to go. The nonmember should be allowed to get to the ticket window/booth with equal ease and should be able to get wherever within 5 seconds of paying. You want a many payment methods as possible. On memberships in professional societies: The US government doesn’t pay for such things. They wouldn’t pay for AIP membership when I was a 1310 physicist and they wouldn’t pay for IEEE membership when I was an 0855 electrical/electronics engineer. So I didn’t get into being a member of those things. Government employees get lots of training in government colleges and graduate schools, like AMETA, ALMAC, Army War College, Navy Postgraduate School, etcetera. @18 The link works, but only if you’re logged in anyway. If you’re logged in now, you can catch up on most of the conference. Where’s that announcement, or where was it? Thank you. EG — did you click the “Not Registered Yet” button? Fill in name, email, employer (“retired” works) and time zone? See the page with the list of green checkmarks verifying your computer and browser work? If you got through all three of those steps and still can’t see the material, I’m baffled. I asked and poked around and there’s no requirement you be a paid member. I suspect you’re using an older browser or older computer that fails the series of checks. As to the question of ongoing availability of the streaming video, it’s been confused, see the “Networking” thread discussion of DSCOVR where one of the DSCOVR scientists was asking about downloading or having the material available to his coworkers. I’d asked the same. One of the staff sent me private mail saying they can’t do that and I should email the AGU about access. I did. Presumably they told him the same. But it’s kind of absurd. I suspect the younger people don’t find this as confusing. I hope. EG — did you get a “thank you for registering” email and an invitation to click a link to check your system to see if it’s going to work? See if that works for you — it should test your connection and show five green checkmarks. That appears to be true for the “green checkmarks” test page as well. I’ll reply to give you an email account I set up and verified works at the AGU streaming page, passes their tests (on my computer), logs in Ok.
Once you log in with that you can use their test page. Either it will work OK for you, or else they’ll tell you when you check that your computer doesn’t satisfy their requirements for streaming. I _think_ the confusion is because video streaming during AGU is handled by a third party “vts.inxpo.com” — it’s their help staff who reply — and they can’t help with anything besides that (like downloading or streaming after AGU ends) and someone at AGU will probably take care of that stuff later. BUt I’m just guessing. So — let’s say we can get into the site, and talk about what’s there. For those who are attending — is there any perceptible mood? Anything you can say about how the younger scientists are looking at the world and their future? I look back on the past decades and from my perspective, often enough, the future looked like a Gary Larsen cartoon. Where are we headed now, from you young folks’ perspective? 22 patrick: The public lecture is boring. It is the same old same old. And it quits after 52 minutes. Hank Roberts: I wonder if Sea Shepherd wants to take on the Red Navy. RC: That puzzles me. If I were “the decider”, I’d have sent an aircraft carrier and a few landing craft to the South China Sea to land on those reef-smothering “islands”, pull the plug on any development, remove all the overburden, and charge China for the costs via an import tax. China couldn’t do squat about it and the rest of the world would cheer. With all due respect, Richard Alley’s public lecture has a defect that is very bad for the public and which amounts to a lie by omission. Richard Alley tells how much wind and solar energy is available in 2 square areas. It is truly enough energy for all of our energy needs at the present. The problem and the lie are the omission of the fact that we have no way to store and transport that energy to where it is needed when it is needed. We don’t have the technology to build the infrastructure required and we won’t have that technology in time to stop Global Warming before the global famine hits. We do have the technology to do it right now with factory built nuclear and we can build all of the nuclear power we need within 5 years. Richard Alley makes no mention of the engineering details, leaving the unsophisticated audience with the impression that renewables can actually solve all of our energy problems right now. That omission is very misleading. It is also a problem because people are relying on it. Many states, including California, Iowa, Arkansas, Kansas, Louisiana, Missouri, Nebraska, New Mexico, Oklahoma, and Texas Have passed or are included in renewable energy mandates. Renewable energy mandates are disasters because wind and solar are so unpredictable and so intermittent that wind and solar increase the CO2 production. People must close zero CO2 nuclear power plants and build new natural gas power plants that make CO2 in order to make up for the unpredictable and intermittent nature of wind and solar power. The result is more CO2 production and doubling or quadrupling or more of your electric bill to pay for the natural gas, the natural gas power plant, the solar farm, the wind farm and new transformers and power lines. The old transformers and power lines break because unpredictable and intermittent sources of electricity like wind and solar overload the old infrastructure. So please quit telling the world that they can have the pie in the sky. They can’t. They have to settle for nuclear right now. References are too long to put in RealClimate. Last note for EG — verified no dues are required to view AGU material, just registration with an email address. Otherwise you’re free to see stuff online. Only remaining possibility would seem to be that your computer and browser are too old to meet the requirements (five green checkmarks on the test) for the streaming service. So it goes. Perhaps AGU will put the programs onto YouTube eventually, as they did for previous years’ meetings. EG @31: Renewable energy mandates are disasters because wind and solar are so unpredictable and so intermittent that wind and solar increase the CO2 production. BPL: No they don’t. Where did you get that idea? I have better things to do than fight their software. Hopefully they will put the talks somewhere more accessible. Safari Version 9.0.2 (10601.3.9) I also have firefox and chrome. Got 5 green checkmarks. Requiring the latest computer is despicable, elitist and antisocial, like something Mediacom would [did] do. I don’t think AGU did that. Thanks for your help. Please keep me informed when the meeting comes out on youtube. That is blatantly, laughably false. Every single word of it. You are taking advantage of the absence of moderation of these comment threads to abuse them as a platform for your ridiculous anti-renewable ravings. Which is the behavior of a boorish troll. We here at RC know this rebunking of your anti-renewable FUD is bogus, because we’ve been around the circle numerous times. We have seen repeatedly that much of it is completely outdated, and even more is–let’s be kind–“over-interpreted.” Certain bits–notably your paragraph 4–are easily demonstrated to be false by simple recourse to real world observations. So, no tendency of renewable portfolio to kill off nuclear. 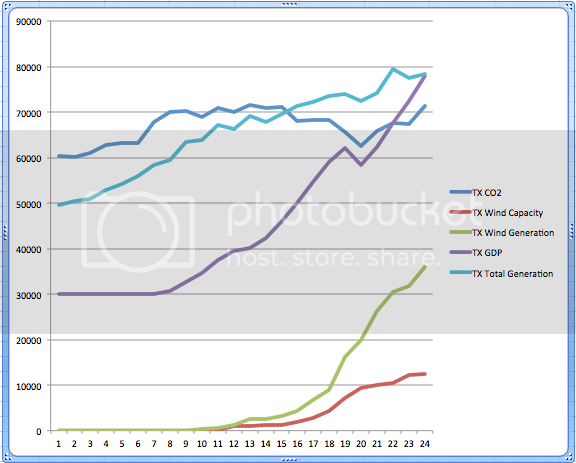 As to the rest, well, using easily available data I ginned up a rough graph of Texas CO2, GDP, wind (both capax & gen), and total generation, scaled suitably to be able to eyeball trends. Bottom line: during the period during which wind increased from 0 to roughly 10% of total electric generation, CO2 emissions stayed approximately flat, while state GDP increased by a factor of roughly 2.5. In short, your note is in the realm of crankery. And I seriously doubt that Dr. Alley is going to be any more impressed than we have been. My goodness, as someone who is well-involved in what is going on in the energy world I don’t think I have ever read a paragraph regarding wind or solar energy that is more full of half-truths or tired, long debunked canards. And the first and last sentences are bald-face lies. Here is a hint: Large power companies themselves are in the process of implementing and/or building large scale wind and solar energy power producers. Some on land, some off-shore. And nowadays energy companies do not commit to build any energy production facility (regardless of energy source) unless they are confident that it will be financially viable. Most important and inexcusably not mentioned is the fact that energy companies are switching from high CO2 producing coal-fired facilities to less CO2 producing natural gas facilities. Which is a far cheaper process across the board than nuclear facilities when all costs are considered. The last sentence regarding transformers and power lines breaking due to wind and solar overload is beyond the pale. Wow. Again, power companies do not build facilities to lose money. Goodness, talk to actual non-nuclear power producers or regulators instead of shooting crap from the hip. Repeating old, debunked canards does absolutely nothing to make them any more true. That is the tactic used by many climate warming deniers. RC: Nebraska has a lot of grassland with deep soil. We lost foot after foot of topsoil in the dustbowl and barely made a dent. The deep center of the Ogallala aquifer is around Ogallala, Nebraska. We will have soil and water even if everyone else in the region runs dry. Our land’s highest, best use is probably a mixture of solar farms in the driest and poorest areas which concentrate water by runoff onto neighboring land used either to return to nature and grow grass (with cows optional) to sequester carbon by building soil and/or be periodically harvested to provide feed for cellulosic ethanol. But the bulk of the land is destined to grow grain. One of the best already-in-production prospects for cellulosic ethanol is stover, which is everything left over after harvest. Eat the corn, extract ethanol from the waste, and toss the residue back on the fields. Nebraska is also great for wind. We’re right next to Iowa. They’re not a big state but they’re one of the top wind power states. So, I’ll let others discuss their state’s particulars, but for Nebraska, a drive to promote renewables – corn stover ethanol in particular – is precisely the wisest state policy. What makes you think nuclear is any safer than fossil? We’ve already had Three Mile Island, we’ve already had Chernobyl, we’ve already had Fukushima. What makes you think the possibility of yet another, more serious, nuclear “incident” can be discounted? It’s been just a matter of sheer luck that Fukishima wasn’t much worse than it’s turned out to be (so far, knock on wood). If it had been worse, then how do you go about evacuating a city like Tokyo? And how do you manage to protect all these very vulnerable facilities from terrorist attacks? Talk about pie in the sky! Edward Greisch: We do have the technology to do it right now with factory built nuclear and we can build all of the nuclear power we need within 5 years. RC: Well, here in Nebraska, I can only imagine that it was because an engineer bet s)he could design and get built a nuclear reactor on a sand bar in the middle of the Missouri…. EG #31 I agree with you re Nuclear power but is 5 years really possible ? I assume you are talking Gen 4 SMRs but I think their implementation is a bit further out than that. And confirming (hat tip to Eli) the videos remain available. BPL: Sure they are, Victor. And aliens built the pyramids. among other places. If wishes were horses, beggars would ride. Where would I get the notion that nuclear is safe? Japanese laws and bureaucrats murdered 2000 people by unnecessary evacuation. Zero people have died from Fukushima radiation. If anybody had died from radiation at Fukushima, the media would have told you his name over and over again. They didn’t. Zero people have died from 3 mile island radiation. Fewer than 100 died from Chernobyl radiation. The Chernobyl reactor was a primitive Generation One machine without a containment building. American reactors have containment buildings that can contain any accident. We get 99.9% of our radiation from natural sources, called Natural Background Radiation. The total radiation in Fukushima is less than our Natural Background here in Illinois, USA. A nuclear power plant can not explode like a nuclear bomb. A reactor is nothing like a bomb. I would have to tell you how to make a bomb and how to make a reactor to explain why. The reactor at Chernobyl did not explode like a nuclear bomb because that is not possible. Fewer than 100 people died from Chernobyl radiation. Those Soviet reactors were Generation One without containment buildings. Coal kills 3 Million people every year. There is no need for any evacuation zone. The containment building is at least 39 inches thick of very good concrete with extreme steel reinforcement and it has a half inch thick steel liner. Chernobyl did not have a containment building. Where would I get the idea that nuclear power is safe part 2? “Radiation and Reason, The impact of Science on a culture of fear” by Wade Allison. The Wade Allison in England, not the other Wade Allison at Harvard. By knowing about natural background radiation. By understanding how a reactor works and by understanding how a bomb works. “The Rise of Nuclear Fear” by Spencer Weart. EG #31 I agree with you re Nuclear power but is 5 years really possible ? No, it is not remotely possible, as Ed’s own references showed last time we circuited this merry-go-round.